A whole set of ceremonies and media events are scheduled in Mexico for Monday, September 19, 2005. It is the 20th anniversary of a devastating earthquake, that shook not only Mexico City, but also the consciences of a generation of Mexicans. This is my recount (taken from earlier posts in different threads) of the Big Earthquake and the aftermath. I was thinking. Twenty years from now... Will the US commemorate Katrina as a lesson learned? It was 7:19 a.m. on September 19th, 1985. I had to go to the shareholders' meeting of the paper. My (then) wife had a dental patient at 9:00. My older son, 4, had to go to kindergarten, and my mother-in-law was visiting us, and would stay with the 8 month old baby. My wife was about to take a shower when the building started to tremble. I was practically thrown from the bed, and ran to fetch the children. We all gathered near the exit door, where we considered to be the strongest place in the apartment. The building, we knew, had hidraulic antiseismic pillars, but we weren't certain about the maintenance. As we sat down next to the door, my older son asked me: "Dad, is this an earthquake?". I answered: "Well no, it's a tremor". But the quake continued, we heard the earth rumble, the lights went off, and I changed my mind: "Yes, it's an earthquake. A big earthquake". Since we were used to earthquakes -and this one didn't seem to us as harsh as one felt in 1981, when we lived in another building- we thought on resuming our daily life, even if -as in other occassion- the phone line died. As I walked the little boy to kindergarten, I noticed all the cars were parked, and people were listening to the radio. I noticed long lines in the telephone booths. The school was closed. I dropped by the candlelit ma & pa store -run by a Swiss- to buy some batteries for the radio. A well known newsman was vividly reporting the damage at the Zona Rosa, fallen buildings, people crying for help from the collapsed buildings, bystanders sstarting to remove rocks and debris in an effort to save the persons caught under their former homes or workplaces. My reaction then was to go to the phone booth to call my dad (he worked at the Zona Rosa) and my mom. No one answered at my dad's work, so I feared the worst. My mother was allright and said he had left for work a few minutes before the quake (He was allright, saw the earthquake from his car, went to his job, but no phones worked). The radio informed us about other zones touched by the quake (it was a pattern: Mexico City is built over dried lakes formerly connected by canals; the biggest destruction was where there had been water in the times of the Aztecs). Among those zones, the Roma burough, were my (now former) brother in law and his (then) wife lived. The paper was downtown, in the most devastated area. The wive's office was at Colonia Roma, no way it could be used. I walked to Colonia Roma to see what had happened, and the situation of my brother in law and his family. It was terrible. The stench of gas leaks, the quantity of broken glass, the people with a lost face, getting into what was left of their homes to recover books, photographs, the TV, a mirror. A nice building that lost all the facade, and some of the occupants looking wildly to the outside. And crumbled buildings. Dozens of young men and women using their hands to get rid of the debris and to try to rescue other persons. One of the crumbled buildings was opposite to my brother-in-law's "horizontal condo". Their house had little damage. Just a few pieces from the builing that fell on their ceiling. They had no water, no electricity, no gas, no phone. And a big discussion whether to leave their house or not. They decided to stay, lest someone enter and rob them. The government was so amazed at the magnitude of the tragedy, that it didn't do anything. Firemen, policemen and soldiers were helping the people with no coordination whatsoever. Teenagers and young people of those days now name themselves "The Earthquake Generation". They organized themselves, and the rest of the population, in order to help the victims. They proved to be better than the government. It is seen now as the starting of the end of the PRI government. But the story doesn't finish there. The day after, a 6.7 replica shook us, around 8 p.m. During the replica, I grabbed the kids and put the smaller one on my lap, and the bigger one jumped on my lap too. After it, we decided to go rescue my wife's brother's family, whether they wanted it or not. By then Colonia Roma was a very strange place. Gas leaks scares, darkness and paranoia, people getting out like gypsies, with bundles of stuff (one gigantic mirror) or camping in the few parks, soldiers getting into people's houses and asking them to evacuate. I arrived at my brother in law's and found his wife preoccupied. 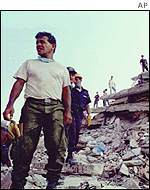 He, an engineer, had gone to verify some buildings in another part of the city (precisely were we lived in 1981, one of the hardest hit zones; our former building was evacuated). I told her nevertheless they had to go. The fact that soldiers were evacuating people (so the choice was the shelter or our house) convinced her. We pushed the Vocho (VW Beetle) a few blocks (to prevent an explosion, if gas was leaking) and drove home with their children and the maid. My brother in law arrived a few hours later, and we all slept in the living room, very near the exit door. My brother in law and his family decided they would not take it any more, sold their home and moved to Oaxaca (now they live, separately, in the US; their daughter is in the US Armed Forces). Little did we know that the usual "security measures", such as getting below the pillars, were good for very little. In fact, most of the people who were beneath doorways in collapsed buildings did not die crunched by the debris, but by asphixia. That's how Manuel Altamira, a reporter from the paper, died. In one Catholic school, while all the other girls assembled in the schoolyard, one group was told by their nun-teacher to crunch under their desks. They all died. A morgue was set in the baseball stadium. The official death toll -in a lying regime- was over 9,000. The official "disappeared" toll makes the number of victims rise to 20 thousand. Now September 19th is the Day of Civil Protection. Day of drills, of getting information on how to act when a natural disaster arrives. Talked to my wife about that day. She and three of her siblings are part of "the Earthquake Generation". She wasn't in her way to the University that morning, since she had exempted the Statitics exam. Most of her classmates were caught in the subway. Scary. One of her younger brothers was at his High School near the Zona Rosa, and across the street a small college, Universidad Chapultepec, collapsed. He and other students, among with the teachers, went to UCh. to try to save people. Several students and teachers from that college were rescued. My brother in law could save none, but he was able to drag out some very badly torn corpses of young students. The other young one wasn't as lucky. He was at a technical school, downtown, very near the paper, and the building started to collapse. He and some of his classmates managed to jump from building to building, as the structures were falling behind their backs. He could reach for safety about one block from his former school, in the middle of perhaps the most striken zone in the city. He was taken to his house by an unknown bystander. Pale, shaken, full of dust. He cried on his mother and his sister's shoulder for the whole evening and night. About half of his classmates died. He left school and had to take therapy. Those were times of great solidarity. People helping people, bypassing an incompetent power. There were, of course, the top news stories. Incredible, but true. Most of them, related to fallen hospitals. Specially interesting are the stories of Hospital Juarez, where several newborns were rescued alive, one of them one week after the quake. "They survived because they didn't know fear", said Nobel Laureate Octavio Paz. These kid's lives are followed every September 19th. Last month they turned 18, and their luck has been varied, as with any sample: from the high-school drop out whose girlfriend is already expecting a baby to the Chemistry student with awards and scholarships. Another great story is about the woman who had an abortion at Hospital Juarez, got trapped in the building, and could only hear the cries of a newborn; she sang lullabies to the baby, talked to him, tried to confort him (and herself). Both were rescued. Or the doctor who lost his fingers during the quake, later had his toes implanted and was back to work. Or the two men who were trapped next to the bar in the destroyed Hotel Regis, for three days, in a tiny space full of liquor bottles. They were rescued alive, and very drunk. Or the everyday work of famous tenor Placido Domingo, doing everything in his hands to rescue some cousins and nephews in Tlatelolco (all died). On November 2nd, relatives of those who died in the most known places (such as the Nuevo Leon building in Tlatelolco, with over 300 dead, or the Benito Juarez housing project) put massive offerings there. But little more. On Nov 2nd. 2002, next to the parking lot where there formerly was the building in which singer "Rockdrigo" (and reporter Altamira) died, a group of young music fans painted all sorts of conmemorative graffiti in honor of the musician. How did the people react to the incompetence of the government? A father that is not with his children during hard times loses their respect. A father who refuses for external help, because of pride, and then has to ask for it, loses their respect. A father who wants to hide the ugly truths and to obviously fool his children loses their respect. When children learn that they can do better if they organize themselves, they become independent. Now translate this to a paternalistic control-freak corporatist nationalist government. Official corporations crumble, new grassroots organizations grow, citizen's don't believe in the omnipotence of Government. They're not afraid anymore. The city turned left, never to go back to the PRI. This was also reflected on the polls. The former ruling party lost the majority in the city in the next election (1988), and with a brief interlude, has been losing ground ever since. Out of the last 240 electoral races in the city (President, Senators, Federal Representatives, Major, Local Representatives, Submajors) it has won only one. It now has the same average as the hammer & sickle Unified Socialists did in '85, and the heirs of the extint Communist party have won all majoral elections (and now recovered their absolute majority in the local Assembly of Representatives). The unpreparedness for those tragedies hurt the government , marked a generation of young people ("the earthquake generation", now in their late thirties) and gave rise to a new "civil protection culture", even if there's still corruption and even if most Mexicans are poor. We have had hurricanes, volcano eruptions, earthquakes, etc; we've also have had our share of industrial nuisances (arsenic in the water in the north of the country), but the death toll is very slight in comparison, and most of the perpetrators of industrial mess have been tried by an special prosecutor for the defense of the environment. These are societal triumphs, regardless of the income level. "How did the people react to the incompetence of the government? The city turned left, never to go back to the PRI. " Let's hope that the reaction of the people here in the USA will be similar, that the people will come to realize that those we have relied on for help in times of trouble are completely incompetent in providing any help. It's an ill wind that blows nobody any good. Perhaps the winds of Katarina will help blow the incompetent and uncaring pack of lobos right out of Washington. Fbaezer, I remember the tv reporting on the horrendous devastation in Mexico City. IT was heart-wrenching to see the death and destruction, expecially in the poorest parts of town--so much like Katrina. As MA said, we can only hope that the younger generation will begin to realize it has power that until now, it never appreciated. I fear that more destruction will be done by this administration, but have hope for the younger generation's new awareness. Thank you for the reminder and for the personal family stories of that awful time. Thanks fbaezer, I also happen to talk to a guy in the Seattle area today Orcas Island in the SanJuans, happens that they he says are waiting for the big one to hit anytime, or not - he LOL - says they are in an active period and alot of plate movement. and we can only hope that we're prepared for it. fbaezer, thank you for reminding us of this old planet's ability to shock and awe us on a regular basis. The human race has a determination to survive no matter what happens. I remember the earthquake. A friend went down to report on it, though of course not in the first few hours. I remember your post from the first entry. I apprecitate this thread now. Thank you. "IT was heart-wrenching to see the death and destruction, expecially in the poorest parts of town--so much like Katrina." I must say that the 1985 earthquake in Mexico hit the middle and lower-middle (by Mexican standards) classes the hardest. This, because the areas most hit were over the old lake over which the original city was founded and built. The rich tend to live on hilly neighborhoods and the majority of the poor in the outskirts. It's tough to say this but, perhaps the sociodemographic status of the earthquake's victims (only the truly rich were spared) helped raise the sense of government incompetence. The lack of competence in helping those hit by Katrina certainly has raised the sense of government incompetence among those who still thought this administration was competent. Those who already knew how dangerously incompetent the Bush administration is, are horribly saddened at yet more unnecessary death and devastation. Thanks for the post, and the reminder, fbaezer. fbaezer, it's posts like these I feel like I've learned more about Mexico in A2K than in school. I've got you and edgar to thank. You made me think of an important earthquake story: The seamstresses. One of the places where the earthquake's effects were most devastating was along a street that crosses the city from center to south: Calzada de Tlalpan, which used to be a canal in prehispanic times. Part of the "fashion district" touches that street. On September 19th 1985, several "apartment" buildings collapsed because they were used as sweatshops for seamstresses, and were loaded heavy machinery that should not have been there. On one building, the corner of Tlalpan and San Antonio Abad, the foremen did not let the working women flee. Only a few managed to scape, but 150 died. 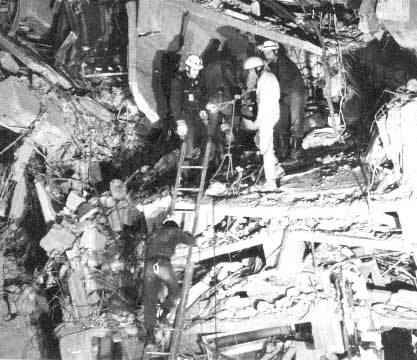 Several dozen working women were trapped or crushed on other buildings. The earthquake surfaced many ugly hidden things. This was one of them. The surviving seamstresses organized a cooperative, then a union (Sindicato de Costureras 19 de Septiembre) and became very active in promoting urban popular organization. Over the years, as the textile employers moved to other places where labor is cheaper (Central America, India, Pakistan), the union lost contracts and power. It is now only a civil association. A few weeks ago, we were having the upteenth cathartic talk about it, with my brothers-in-law. The older one -the one who was rescuing corpses at a nearby university- said that the thing that must stroke him was when he found a woman's hand among the debris. It was clutching a purse. He called his friend to take away the rocks over it. They did. The hand, and part of the arm, was away from the body. And it was clutching her purse. The younger one -the one who escaped through collapsing buildings- said that he was running downstairs, half-carrying a girl school mate of his who was in shock, while another mate was yelling for his brother -who was in the collapsed part of the school- and running at the same time, blindly, for they were only surrounded by falling walls, and suddenly the stairs were gone, and he stepped in something bland, gushy, and he kept on running. He says he still feels the feeling of that couple of steps. He thinks he was running over fresh corpses. So sorry for what happened, Fbaezer.